The Alaskan Malamute /ˈmæləˌmjuːt/ is a large breed of domestic dog (Canis lupus familiaris) originally bred for their strength and endurance to haul heavy freight,  and later as a sled dog. They are similar to other arctic breeds and spitz breeds, such as the Greenland Dog, Canadian Eskimo Dog, the Siberian Husky, and the Samoyed. Although it is believed that the first dogs arrived in the Americas 12,000 years ago, people and their dogs did not settle in the Arctic until the Eskimo people 4,500 years ago and then the Thule people 1,000 years ago, both originating from Siberia. Malamutes were bred by the Malemiut Inupiaq people of Alaska's Norton Sound region,  who were a Thule people. The coat of the Alaskan Malamute is a double coat. The undercoat has an oily and woolly texture and can be as thick as two inches. The outer guard coat is coarse and stands off the body—longer at the withers but not more than one inch off the sides of the body. Ears are small in proportion to the head and stand firmly erect when at attention. The Alaskan Malamute is a heavy dog, with a more formidable nature and structure than the Siberian Husky, which is bred for speed. The Alaskan Malamute is bred for power and endurance, which is its original function and what the standard of the breed requires of Alaskan Malamute breeders. The usual colors are various shades of gray and white, sable and white, black and white, seal and white, red and white, or solid white. There are a wide range of markings in the breed including face markings, blazes, a splash at the nape of the neck, and a collar or half collar. White is often the predominant color on the body, parts of the legs, feet and part of the markings of the face. In terms of color variants, some Malamutes exhibit a dark grey to buff-colored undertone around their trimmings and white areas, presenting with a color-linked gene known as ' Agouti'. Two agouti alleles, with the possibility of a third, appear to be found in Malamutes: 'aw' (Agouti Pattern or Wolf/Wild Pattern), 'at' (Tan Point Pattern or Black Pattern), and 'awat' (Heterozygous Agouti or Dark Agouti). The eyes of the Alaskan Malamute are almond-shaped and are varied shades of brown; however, the darker eye is preferred. The physical build of the Malamute is compact and strong with substance, bone and snowshoe feet. According to the AKC breed standard, the Malamute's tail is well furred and is carried over the back like a "waving plume". Corkscrew tails are occasionally seen but are faulted in the AKC breed standard (a corkscrew tail is commonly seen in the Akita). The Malamutes' well-furred tails aid in keeping them warm when they curl up in the snow. They are often seen wrapping the tail around their nose and face, which presumably helps protect them against harsh weather such as blowing snow. Their ears are generally upright, wedge-shaped, small in proportion to the head and set to the side of the skull. The muzzle is deep and broad, tapering slightly from the skull to the nose. 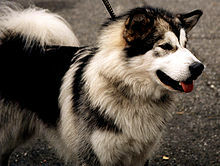 Nose and gums are black but some Malamutes have a snow nose, which is black with a pink undertone that can get darker or lighter, depending on the season. Alaskan Malamutes are still in use as sled dogs for personal travel, hauling freight, or helping move light objects; some, however, are used for the recreational pursuit of sledding, also known as mushing, as well as for skijoring, bikejoring, carting, and canicross. However, most Malamutes today are kept as family pets or as show or performance dogs in weight pulling, dog agility, or packing. Malamutes are generally slower in long-distance dog sled racing against smaller and faster breeds, so their working usefulness is limited to freighting or traveling over long distances at a far slower rate than required for racing. They can also help move heavy objects over shorter distances. An adult male Alaskan Malamute can pull around 500–1,500 kilograms (1,100–3,300 lb) of weight, depending on build and training. The Malamute has a long genetic foundation of living in harsh environments, and many of its behaviors have adapted to survive in such environments. [ citation needed] Independence, resourcefulness, high intelligence,  and natural behaviors are common in the breed. Malamutes, like other Northern and sled dog breeds, can have a high prey drive, due to their origins and breeding. This may mean that in some cases they will chase smaller animals, including other canines, as well as rabbits, squirrels, and cats. While Malamutes are, as a general rule, particularly amicable around people and can be taught to tolerate smaller pets, it is necessary to be mindful of them around smaller animals and small children. Malamutes are very fond of people, a trait that makes them particularly sought-after family dogs, but unreliable watchdogs. Malamutes are nimble around furniture and smaller items, making them ideal house dogs, provided they get plenty of time outdoors meeting their considerable exercise requirements. Alaskan Malamutes also often participate in animal therapy programs, like visiting patients in hospitals, due to their soft nature. If they are year-round outdoor dogs, letting them play in a baby pool filled with cold water in summer keeps them cool. In the winter, they prefer snow. Malamutes are usually quiet dogs, seldom barking. When a Malamute does vocalize, it often appears to be "talking" by vocalizing a "woo woo" sound. It may howl like a gray wolf or coyote, and for the same reason. A similar-looking Spitz dog, the Siberian Husky, is much more vocal. An Inupiat family with a Malamute from 1915. The Alaskan Malamute had a prominent role with their human companions – as a utilitarian dog, working, hunting, and living alongside humans. The dogs were renowned for their excellent hunting abilities and were used to hunt large predators such as bears. They also aided their owners in finding seals by alerting to seal blow holes. The interdependent relationship between the Mahlemut and their dogs fostered prosperity among both and enabled them to flourish in the inhospitable land above the Arctic Circle. The Malamute dog has had a distinguished history; aiding Rear Admiral Richard Byrd to the South Pole, and the miners who came to Alaska during the Gold Rush of 1896, as well as serving in World War II primarily as search and rescue dogs in Greenland, although also used as freighting and packing dogs in Europe. This dog was never destined to be a racing sled dog; it was used for heavy freighting, pulling hundreds, perhaps thousands of pounds of supplies to villages and camps in groups of at least four dogs for heavy loads. A 2000 investigation published in the Journal of the American Veterinary Medical Association examined the "Breeds of dogs involved in fatal human attacks in the United States between 1979 and 1998". The journal authors made several notes on the original article, including the fact that police dogs were excluded from the numbers. Thus, as a breed, Malamutes appear to be far more likely to fatally kill people than other dogs, but because their overall population is small, these events do not occur as frequently as deaths from other breeds; an increase in the number of Malamutes would, presumably, increase dog bite-related fatalities. This does not necessarily indicate that Malamutes are more likely to bite than other dogs; a small dog could bite more often, for example, but those bites may result in fewer fatalities. Although pitbullinfo.org claims to be published by a not-for-profit organization, that organization is not disclosed on their website. Thus, skeptics may choose to calculate the fatality rate independently by adjusting the original data by the population of each breed between 1979 and 1998. ^ a b Brown, S K; Darwent, C M; Wictum, E J; Sacks, B N (2015). "Using multiple markers to elucidate the ancient, historical and modern relationships among North American Arctic dog breeds". Heredity. 115 (6): 488. doi: 10.1038/hdy.2015.49. PMC 4806895. PMID 26103948. ^ Handford, Jenny Mai (2009). "Dog sledging in the eighteenth century: North America and Siberia". Polar Record. 34 (190): 237. doi: 10.1017/S0032247400025705. ^ a b c "Alaskan Malamute Breed Standard". American Kennel Club. American Kennel Club. 2013. Retrieved December 17, 2013. ^ "Breed Standard". Alaskan Malamute Club of America. Alaskan Malamute Club of America. Retrieved December 17, 2013. ^ I've heard Malamutes are dumb. Is this true? ^ a b "Alaskan Malamute Dog Breed Information, Pictures, Characteristics & Facts". Dogtime. Retrieved December 7, 2018. ^ "Alaskan malamute - Is It the Right Dog for You?". alaskanmalamute.org. Archived from the original on April 9, 2009. ^ "Alaskan Malamutes". 2Puppies. Retrieved November 5, 2018. ^ "Do malamutes bark? - Alaskan Malamutes FAQ". www.alaskan-malamutes-info.com. Retrieved October 5, 2018. ^ a b "Report from the Kennel Club/British Small Animal Veterinary Association Scientific Committee: Summary results of the Purebred Dog Health Survey for the Alaskan Malamute breed" (PDF). The Kennel Club - UK. 2004. Retrieved October 30, 2018. ^ "The Goody Pet". www.thegoodypet.com. Retrieved October 30, 2018. ^ "Kennel Club/British Small Animal Veterinary Association Scientific Committee. 2004. Purebred Dog Health Survey" (PDF). The Kennel Club. Retrieved December 9, 2004. ^ "Alaskan Malamute Club of America Health Committee". Archived from the original on February 8, 2009. ^ "Arctic Dog Rescue and Training Center » Canine Diabetes". Archived from the original on September 28, 2013. Retrieved May 29, 2013. ^ Bryan D. Cummins, 2002. First Nations, first dogs. Detselig Enterprises Ltd., Calgary, AB. ^ a b "Alaskan Malamute Illustrated Standard-History" (PDF). AKC. Retrieved December 9, 2014. ^ "Sorry, huskies, Malamute now AK's state dog". Alaska Dispatch. April 10, 2010. Archived from the original on April 25, 2010. Retrieved April 20, 2010. ^ Chow, Denise (April 26, 2018). "Why scientists are teaching AI to think like a dog". NBC News. Retrieved June 20, 2018. ^ Ehsani, K; Bagherinezhad, H; Redmon, J; Mottaghi, R; Farhadi, A (March 28, 2018). "Who Let The Dogs Out? Modeling Dog Behavior From Visual Data". arXiv: 1803.10827 [ cs.CV]. ^ Sacks, Jeffrey; Sinclair, Leslie (September 15, 2000). "Breeds of dogs involved in fatal human attacks in the United States between 1979 and 1998" (PDF). Journal of the American Veterinary Medical Association. 217 (6): 836–840. doi: 10.2460/javma.2000.217.836. PMID 10997153. Retrieved November 12, 2018. ^ "Dog Bite-Related Statistics". PitBullInfo.org. Retrieved November 12, 2018. Wikimedia Commons has media related to Alaskan Malamute.